Together with my three, new Chilean friends I walk towards La Junta. La Junta sounds like a lot. It is no more than a landing strip and a bridge. 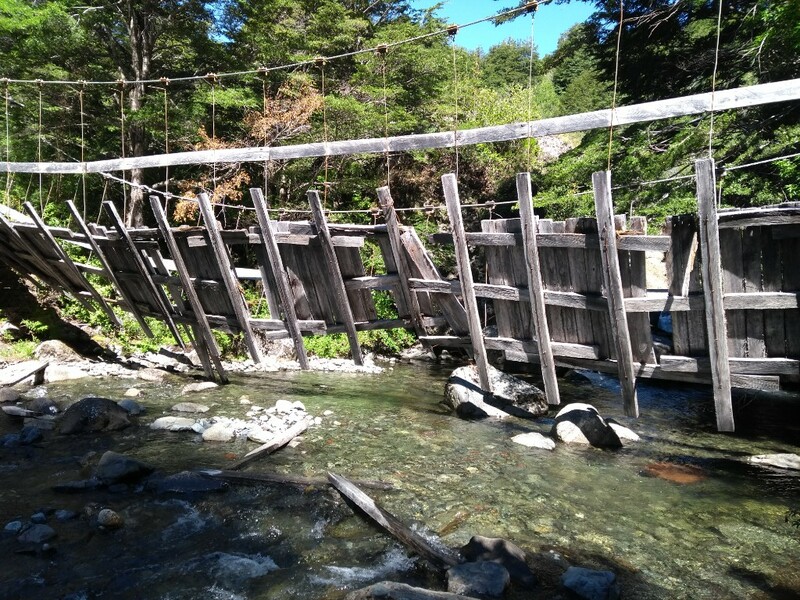 Soon after La Junta we reach la casa de Leticia + termas, where we meet three more Chileans. They have camped in Leticia’s ‘garden’. Maté and small talk follow. My young friends decide to camp here. Finally, after our farewells at around 11:30 am, I’m hiking at my own pace again. Today’s first goal are the next termas, which are a few hours hiking. 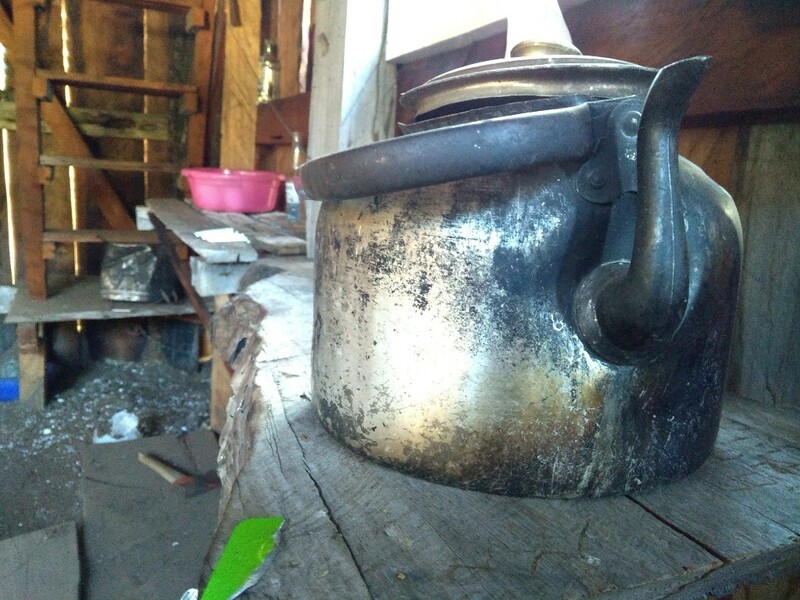 I planned on hiking to the border and from there to a shelter, situated at Cerro Tronador. Because of today’s late start and Maté I won’t have enough time for this left. Somewhere in the middle of a forest I meet a large group of oncoming traffic, all Chicos. ‘Where are the Chicas?’, I’m joking. One the chicos murmurs something. Something with faith and pilgrimage, chicas aren’t allowed on this trip. …And off they are! 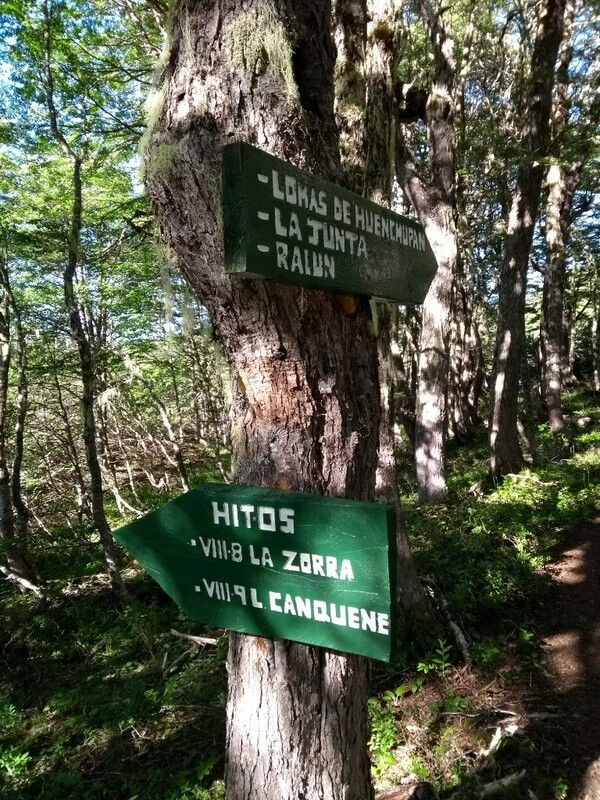 After refreshing at the termas, I resume hiking with a modified plan. Too bad for me: the Jesuitas have planned a not-so-funny-afternoon hike. What follows: pretty steep uphill hiking, followed by pretty steep downhill hiking. After this the trail is overgrown with mean prickly plants. The sun is shining fiercely and the Tábano’s feast on me, the buffet. In my notes: ‘Paso Peligroso’. I agree. Upon reaching the next bivouac, a rifugio Chilean style, I’m done for today. 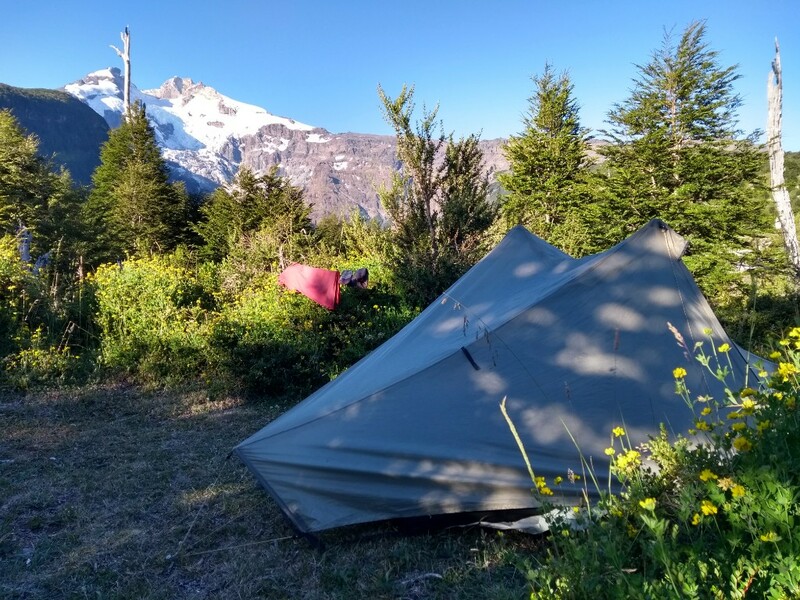 I pitch Tarptent with views on- and under the rumbling sounds of Cerro Tronador. This shelter is a bit too scruffy for me. The next morning the sun is still shining! Yeah! It takes me a few hours to reach the office of the Carabineros de Chile. 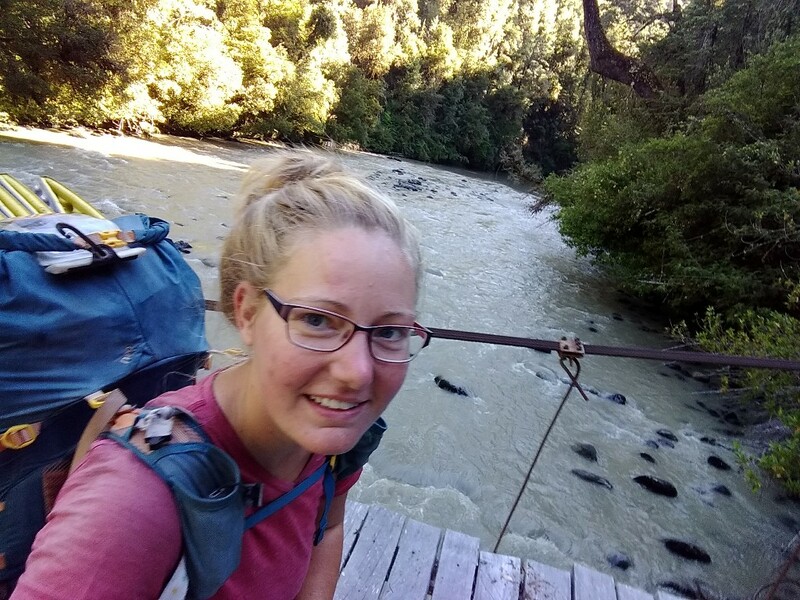 After hiking a few months in Chile and Argentina and having crossed many borders, I’m able to answer all the questions flawless and in Spanish. A few hours later, in Pampa Linda, I check in in at the Argentinian border office for a new stamp in my passport. Waymarkers! Welcome in NP Nahuel Huapi! The Argentines are busy with my visit: the young, new recruit is allowed to enter my data into the computer. Meanwhile the two older, experienced guys are shouting instructions at him, feeding me dried meat and chatting about Queen Máxima. After this there’s the restaurant at Pampa Linda. Where I’m feasting at an ice cold soda-pop and a Milanesa while waiting for the bus to Bariloche. 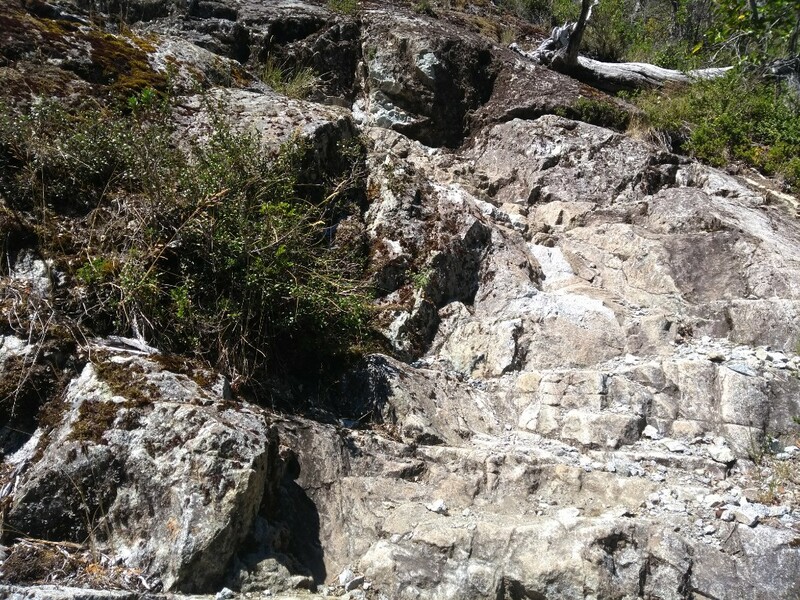 More on the GPT (and the most up-to-date info at Wikiexplora and here more about the Ruta de los Jesuitas.